A deep garnet color portends all that is to come! The aromas are of red and black fruit, spice and an intriguing note of tangerine. Red fruit flavors predominate, with raspberry and cherry immediately coming to mind. Orange zest and bitter chocolate complete the tasting experience. This rich and complex wine expresses the uniqueness of this vineyard. 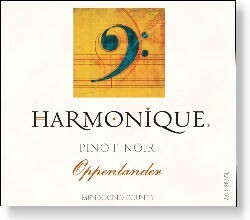 100% from the 30 year old Oppenlander Vineyard, located in Comptche, north of Anderson Valley near the coast.